UMBC, Baltimore City Public Schools (BCPS), and the Northrop Grumman Foundation have launched a $1.6 million partnership to boost science, technology, engineering, arts, and math (STEAM) education. 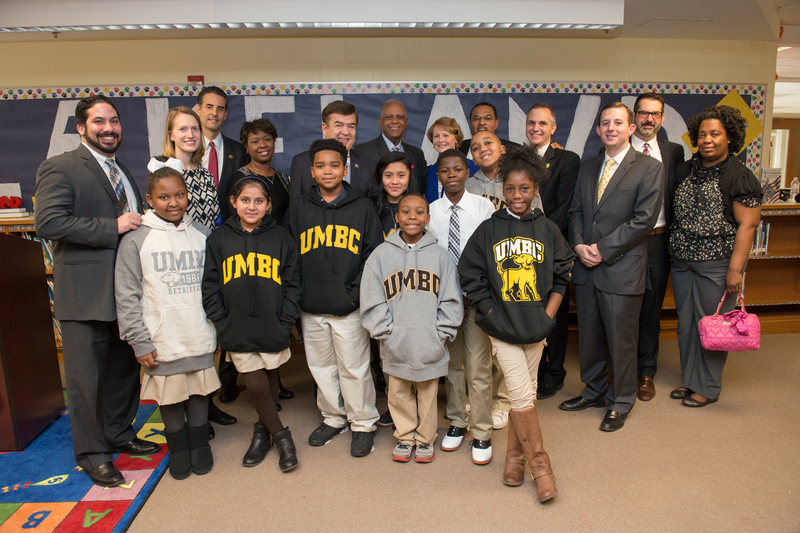 This news, announced on January 7, 2016 at Lakeland Elementary/Middle School in Southwest Baltimore, marks a significant milestone in UMBC’s ongoing work to support Baltimore’s K-12 students, teachers, and their communities. Three years ago, UMBC President Freeman Hrabowski and Lakeland Principal Najib Jammal met to lay the groundwork for collaboration inspired by the vision and philanthropy of George and Betsy Sherman. The partnership that emerged brought UMBC’s Sherman STEM Teacher Scholars Program, Shriver Center Peaceworker Program, and The Choice Program to Lakeland, and it has already had a major impact. The newly announced partnership will expand this work to support students at three city schools, while providing adult educational opportunities for local residents. Najib Jammal, Baltimore City Public Schools CEO Gregory Thornton, U.S. Congressmen Dutch Ruppersberger and John Sarbanes, Northrop Grumman Chief Operating Officer Gloria Flach, and President Hrabowski all provided remarks during the launch event to illustrate the meaningful impact the partnership will have on students’ lives and in surrounding communities. A primary focus of the program will be the development of a state-of-the-art STEAM Center at Lakeland that will have robust curriculum-based resources, professional development for teachers, and adult education and meeting resources for community members. A second core component is an expansion of The Choice Program, a highly successful national model for community-based intervention that has served more than 20,000 youth and their families from Maryland’s highest risk communities for more than 27 years. Through the partnership, The Choice Program will expand to serve students at Benjamin Franklin High School at Masonville Cove and Excel Academy at Francis M. Wood. The new STEAM Center, developed through a transformation of the recreation center at Lakeland Elementary/Middle School through partnership with Baltimore City’s Department of Recreation and Parks, is expected to feature science labs, a makerspace, digital video and sound studio, computer lab, parent resource room, and community meeting space. Quality STEAM programming and professional development for teachers on topics such as project-based learning and integrating the arts and service-learning into curriculum will maximize the impact of these new resources. This work will help prepare city school students, parents, teachers, and adult education students for success in the evolving economy. It is also designed to help build strong, supportive, and engaged school communities. “The impact of this partnership goes beyond institutional philanthropy. It provides meaningful learning opportunities for all partners, from Lakeland and UMBC students, to teachers and professors, to STEAM professionals,” explained Rehana Shafi, director of the Sherman STEM Teacher Scholars Program at UMBC. The expansion of The Choice Program to Benjamin Franklin High School and Excel Academy at Francis M. Wood will provide a continuum of services to youths facing challenges at school and at home. The program’s 24/7 wraparound services include monitoring and ensuring school attendance; providing transportation to and from school; home visits and family support services; classroom coaching, speakers, and specialists; and afterschool activities. 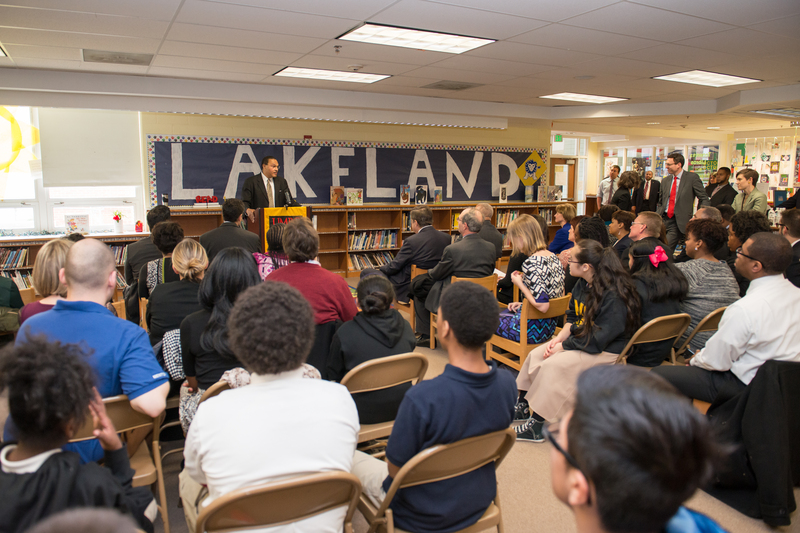 Images (photos by Marlayna Demond ’11 for UMBC): Lakeland Elementary/Middle School students at the partnership launch event on January 7, 2016; group photo of partners and students; and UMBC President Freeman Hrabowski speaks during the launch event.